Discovering Web Services to Improve Requirements Specifications: Does It Help? Service-centric systems pose new opportunities for when engineering requirements. 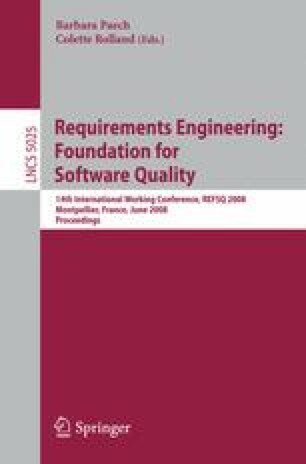 This paper reports an evaluation of software tools with which to exploit discovered services to improve the completeness of requirements specifications. Although these tools had been evaluated previously in facilitated industrial workshops, industrial users had not used the tools directly. In this paper we report 2 industrial uses and evaluations in which experienced analysts used the tools directly on 2 real-world requirements projects. Results reveal that analysts used the tools to retrieve web services that could implement specified requirements, but analysts were less able to improve these requirements in light of the retrieved services. Results have implications for iterative service discovery processes and service discovery algorithms.